Place the filling ingredients in a 4 quart slow cooker. Turn on low for 6-8 hours (or on high for 4 hours). Shred with a fork. Can be made up to 2 days ahead. Place all enchilada sauce ingredients in a blender and combine until smooth. 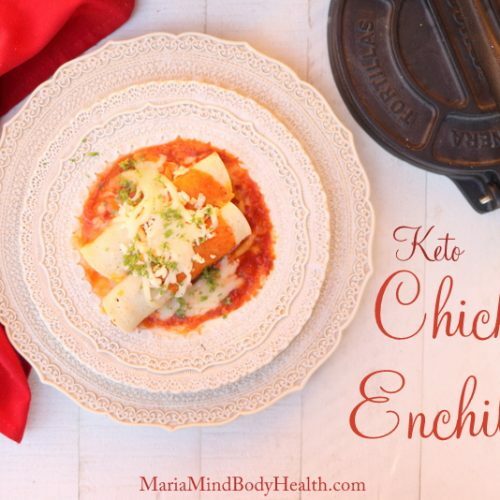 Use for Keto enchiladas. Store in airtight container in the fridge for up to one week. Can be frozen for up to a month. Place the sauce in the bottom of a 9 by 11 inch casserole dish. Place a few tablespoons of shredded chicken in the center of a slice of deli chicken. Roll up like an enchilada. Place onto sauce in the casserole dish. Repeat with remaining filling and "tortillas". Top with cheese if using. Place in oven to bake for 10 minutes or until heated through and cheese is melted. NOTE: You can skip the baking and microwave on HIGH for 1 minute or until cheese is melted.